Amy fights her own battle with RA and an inheritable cancer gene. 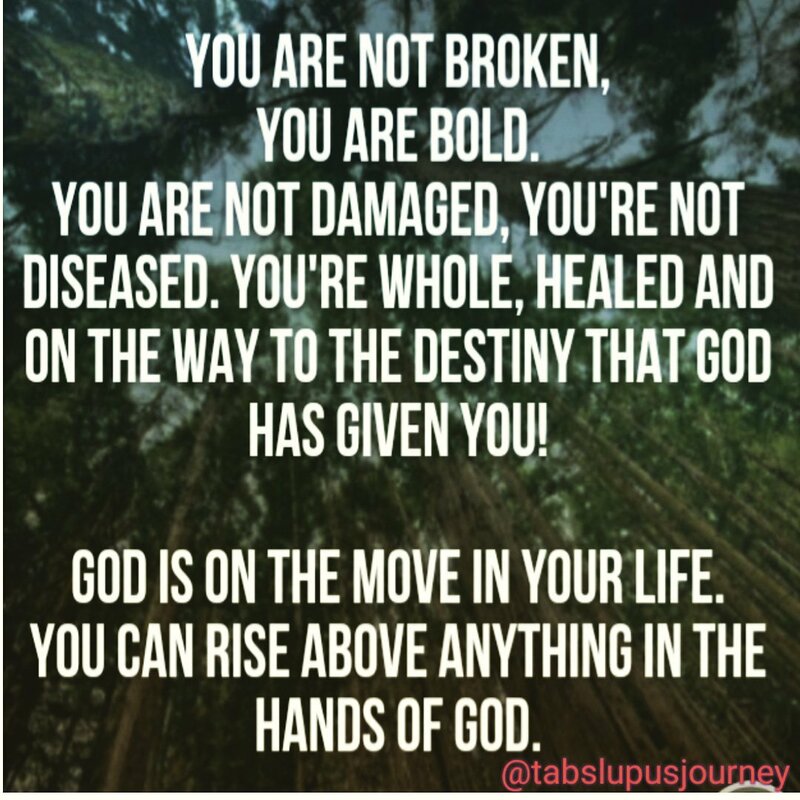 She writes about her faith journey in light of autoimmune disease. Her post are uplifting and encouraging, and I highly recommend taking the time to enjoy her posts. ​Worrying never got me anywhere before. So why should it now? There have been many times when I could have died, but I didn’t. There have been many times that I made plans, but they didn’t work out. And there were many times when I said, “to hell with it,” but things worked out anyway. We think we have control, we desire to have control but our control is very limited. We can control our attitude and behavior, but we have far less control of outcomes. We have no control over what other people will do, what nature will do, what opportunities will be available to us. We want what we want! I think about all the craziness in my life right now with what seems like a trillion diseases that I can not control. The doctors don’t know what to do either. They finally have said the most heart-wrenching words anyone has to hear, “ we can’t do anything for you.” Sitting in the Mayo Jacksonville clinic, the place that was supposed to have the answers, the place I put hope into, within a years time had given up on me. In the moment of heartache, and being lost for what to do next, the only thing that I knew was all I had was God. He can still heal me even if they can’t. He can ease the pain, he can mend the brokenness. It’s taken a bit to realize I can not worry about the next step and chase cures that aren’t there. Its taken a while to realize that I need to face each day one day at a time, one problem at a time. I do not look at my entire illness as a whole anymore, and I do not think about what if. Allow today’s problems to be enough. Worrying about tomorrow won’t make it better. And you might ruin your last day worrying about a day that’s not going to come. We should consider each day as possibly our last because one day it will be. Ask yourself: If today was my last day, what are some things I would want to do? Because of my illnesses sometimes I find myself feeling like I am broken and useless. No wonder, everything in my life has been turned upside down and changed; now everything revolves around my illnesses. Things I once loved were gone in an instant and what’s left of the old me slowly gets stripped away each day. I have no doubt that even if you are not sick, feeling broken or useless may apply to some others as well. It’s not supposed to be that way! However, we can grow tremendously through the changes that we are forced to go through. And we can rise above any obstacles as long we are in God’s hands. The mind is extremely powerful and can change our mood in an instant for good or for bad. Yep, I was told that a few times, over the last few months and it was like a knife in the gut. I could feel my existence get ripped right from underneath me. God just made me stop one day and made me realize it doesn’t have to be that way. I can control what I am thinking. I am not in denial of my reality. But I am a child of God!! And I believe in miracles still. I am not at the mercy of what the doctors say!! I am at the mercy of God! So, I am doing a new thing; and I challenge you if you are still reading this at this point and it has spoken to you at all to try it for a week in your life and let me know how it goes for you. Every time I think something negative, I stop and I immediately think of the positive side. If I am wake up hurting, well I turn that and think, I woke up alive, I have a bed, I have a house, I have AC, I have a family, I am dry etc.. keep going until it speaks to you. I have to be mindful of what I hear and what I think. I will not allow myself to dwell on the negative any longer. I would rather be in control of my mind, have a strong mind and keep my thoughts positive and know that even if the world says this disease is killing me, God can turn this around anytime he wants. I would rather go down fighting with hope, than go down giving up.